That thing we are witnessing from so far away in light-years once happened here roughly 4.5 billion years ago. As the Milky Way condensed into a circulating system and ionized gases condensed into stars and planets started their lazy ellipsoids around those brand-new gravity centers staggering out towards the edge of each tiny solar system, the system settled down into something wild but that followed more deliberate rules than it had initially. Among the planets formed was our little blue world, although it was once more amorphous than it is today and it wasn’t blue until much later in its evolution. It was brutally hot and as it coalesced, solidified chunks of various sizes plummeted into it at accelerated speeds. There are plenty of these solidified chunks out there crashing into our atmosphere even now; NASA estimates that 100 tons (200,000 pounds) of meteoroids hit our atmosphere each day and burn up. Cornell University astronomer Dr. Lynn Carter estimates that 84,000 meteors with a mass of at least 10 grams (about 2 level teaspoons of table sugar) hit the earth each year. While our galaxy was forming, these processes were far more common. With our telescopes—earth-bound, satellite-based, and outward-bound—we see this happening all the time, although paradoxically long ago. The wonderful and talented folks at khanacademy.org have a series focused on these processes. Here’s the first in a series of five video units. Inevitably, there are varying hypotheses and timelines associated with exactly how our galaxy, solar system, star (the Sun), and planet came into existence. Is there variation among the hypotheses? Sure. That’s part of the scientific method. Will we ever be able to go back in time over 4.5 billion years and watch the process happening for the next 4.5 billion years? Highly unlikely (in fact, absurd, but it would be the only way to know with certainty; can you imagine being part of a (1) backwards time travel expedition that (2) was stationed somewhere in our portion of the Milky Way to watch, over billions of years, how the process actually progressed?). What we are left with is an enormous data set collected by telescopes that cover every portion of the electromagnetic spectrum scanning the inner, middle, and outer fringes of all the space that surrounds us, trying to watch how it all works. 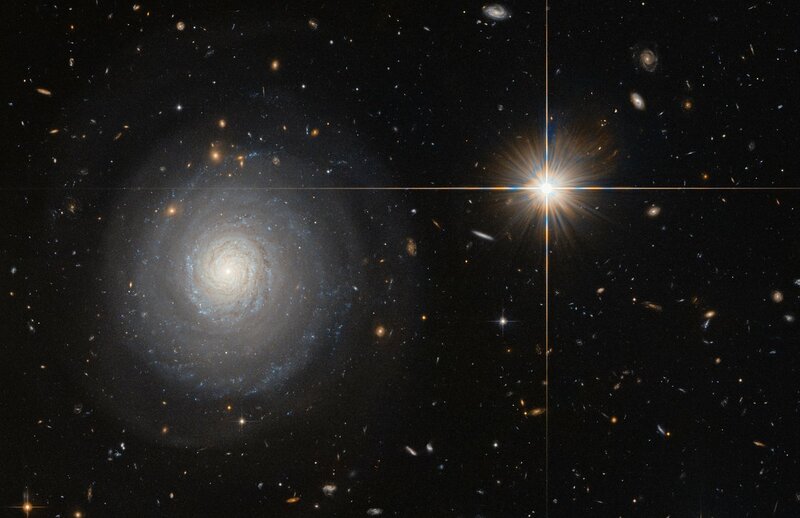 The following is an animated model of how a starburst galaxy forms based on data collected relatively recently by the Hubble Space Telescope’s Advanced Camera for Surveys. This particular galaxy is “only” 300 million light-years from the Hubble. To close, Hubble has gathered so many images of the universe and of galaxies surrounding our own that its earthly handlers at NASA were able to put together a composite video of our nearest galactic neighbor—Andromeda. It is “only” 2.5 million light-years away—spittin’ distance—just over yonder, etc. Watch this astonishing video composite; it is available in resolutions up to 4K HD, so set your YouTube gear to the highest resolution your video card and monitor can handle and prepare to lose your mind! Each point of light is AT LEAST one star; we cannot be absolutely sure as the point resolution this far from (this close to) Andromeda cannot provide certainty. Every day, we can view this celestial wonder and try to comprehend its complexity. For me, it is preferable to know that humankind is unlikely to ever understand even a small fraction of this profundity than it is to dismiss it as something comprehended and explained away by oral traditions conceived well over 5,000 years ago and eventually written down and codified as the single explanation to life, the universe, and everything. With apologies to actual astronomers everywhere. We are all (I assume) very comfortable with the tangible, observable facts that surround us. I am sitting in a chair at a desk in front of a computer I assembled a couple of Augusts ago from parts recommended on the www. My desk is cluttered with papers, CDs (some music, some software), a few groupings of office supplies, and some random stuff that I haven’t gathered the courage to toss yet. We are all (I assume) very comfortable with the tangible, observable facts that surround us. I am sitting in a chair at a desk in front of a computer I assembled a couple of Augusts ago from parts recommended on the www. My desk is cluttered with papers, CDs (some music, some software), a few groupings of office supplies, and some random stuff that I haven’t gathered the courage to toss yet. Oh, and a work glove – I really have no idea what it’s doing here. Beyond the desk, there are a few tables, one for a scanner, one for a printer, one for a reading light next to my recliner (I should call this the Sleepinator™, or perhaps the Napinator™, as I only nap (or “have a kip,” thus the British trademark for the Kipinator™ is born) in it). My cat (her name is Emma) is sleeping on the window seat (a little earlier, she was sleeping in my left armpit as I read in the Napinator™). A brief paws for a picture of my kitty (it’s a little blurry, but captures her majestic qualities quite well I think; as she spends a lot of time sleeping, this is an “action” shot). The floor has a nondescript light brown carpet but is covered by a Persian rug. Various electronics lie about with a nice efflorescence of cabling (I prefer LAN lines to WiFi), and too many books in boxes (although tidy boxes, I might add). Beyond the walls and windows, all objects as well, lies the planet at large, with a scattering of trees interspersed liberally with asphalt and concrete, grass and weeds, shrubs and (less obviously) the invisible beds of fungi waiting to fruit a body and exhale a cloud of spores so that more invisible beds of fungi will grow (and let’s not forget their friends, the adventitious bacteria, etc.). There are squirrels and a variety of birds with wonderful voices, a few neighborhood cats and when accompanied by their obedient masters a variety of dogs, usually of the small and yappy kind (see majestic cat above). An unnecessary miscellany of automobiles, some small and energy-efficient (relatively speaking), some comically large, supported on wheels that would do a gargantuan earth mover proud, move around out there, rushing on errands that may or may not be as important as indicated by their speed. And then there is lots of earth and rocks and sky and, eventually, ocean and, down further, mantle and magma and other molten earth essentials, simmering away at 3,000 to 3,500°C (5,432°F to 6,332°F for non-scientists and Americans) and at a pressure of 1,250,000 (1.25 million) times the pressure up here in my writing room. Above our sky lie other stars, other planets and moons and asteroids and comets and meteors with all of the associated atmospheric heterogeneity imaginable (methane or sulfuric acid or nitrogen or hydrogen sulfide of frozen water or… well, just about anything) and maybe other life forms, other squirrels and cats and dogs and grass and weeds and shrubs and trees and intelligent bipeds (I mean, whom among us really knows at this point in our young, relatively unevolved lives; there are, apparently, in excess of 100,000,000,000 (100 billion) galaxies known to date (with the limits of our present instrumentation) and each of those galaxies is estimated to have 100,000,000,000 (100 billion) stars, each with who knows how many planets and moons and asteroid belts and all the rest). There is a ton (by which I mean way more than a ton) of “stuff” around us, very near and extremely far away and we have some idea of what constitutes it all – molecules (small and large), elements, atoms, electrons, protons, neutrons, subatomic particles, weak and strong attractive forces, electromagnetic particles and waves (energy), gravity, all the subatomic particles you can blast out of nuclear hiding places in the various kinds of accelerators we have designed and built. But all of it, if gathered into a giant ball in giant and ethereal hands like a ball of dirt, composes about 4% of the substance of the known universe. The rest of the universe is composed of “stuff” called dark matter (26% of the universe) and dark energy (70% of the universe). As what I have just said may be new to your way of thinking (and/or you may have just stopped reading as I may be entirely nuts), this is an excellent time and place to watch the following video by Dr. Patricia Burchat of Stanford University. “Dark” matter isn’t dark in color – it’s not black (a color that appears to our eyes and minds when an object has absorbed ALL wavelengths of light in the visible spectrum, which is in turn a very tiny sliver of the overall electromagnetic spectrum), it is not dark in a spiritual or theological sense, it is not dark in the way that Scandinavian “black” metal is dark (that compels me to reach for the “stop” button). Dark matter is only apparent because of its influence in the fabric of the universe, its effect on gravitational forces that, by way of Einstein (and Riemann) permeate that blackness up in the sky at night and hold the shiny bits (including our apparently sky-blue bit) in place. The observation of dark matter is seen in the behavior of galaxies; stars at the edge of galaxies, if only under the influence of gravity, should move more slowly than stars closer to the center. They don’t; the speed of stars rotating around the center of a galaxy move at the same constant rate as the stars towards the middle of the galaxy, so there must be matter that is interacting throughout the galaxy that forces the exterior stars to move at that rate. An oversimplified analogy might be that we do not see air, but we see the effects of wind (but air and winds are composed of atoms of gasses and have mass and energy that we understand very well, so this is a poor, earthbound analogy indeed). The effect of dark matter is seen not only in the circulation of outer stars (and their planets, etc.) around the center of the galaxy but in how galaxies cluster together and how the light from individual galaxies smears due to gravitational lensing. This unseeable matter has enormous effects in our universe, but we are still struggling to find a method of “seeing” (this is a poor word to use here) it. For some stunning computer simulations of how the universe might have evolved in the presence of dark matter and dark energy, watch the “full-size” version of the film at this website (bottom of page). Now, if all 96% of the remaining “stuff” in the universe was dark matter, solar systems and galaxies and clusters of galaxies would tend to cluster and the universe would not seem to be expanding outwards. Instead, we (well, astrophysicists and their ilk) observe a universe that is expanding. Space itself is spreading apart. The hypothesis is that this occurs due to dark energy, the predominant “ingredient” in the universe, one so powerful (in spite of its unseeable nature) that galaxy clusters and the universe that contains them in a web of gravitational force are expanding away from each other, the opposite of what we would expect to see from the more neighborly, clustery behavior of galaxies and their contents. This is weird suprahuman stuff, stuff beyond touch and beyond our usual intuition, unless one bathes the brain in a nutrient-rich broth of advanced mathematics, physics, chemistry, astronomy, and similar elixirs. The concepts of dark matter and dark energy are elusive to those of us who crawl the earth looking for groceries and the next mortgage payment, but I am extremely (EXTREMELY!) pleased that some of us are paying attention to how this whole amazing thing fits together. To close, while I was writing this thing I thought about a great Brian Eno song called “Help Me Somebody” from his amazing collaboration with David Byrne “My Life in the Bush of Ghosts.” The song centers on samples of Reverend Paul Morton letting his congregation know what time it is but is fattened up by funk of the most satisfying kind, delivered by Eno, Byrne, John Cooksey (drums) and Steve Scales (congas, other percussion); I dare anyone to stay still while listening to this track. I obviously dilute Reverend Morton’s intent here, but the song and lyric popped into my mind and seemed to be telling me that this is the nature of the universe – so high, so low, so wide. That’s the 96%. We live in the 4%. As in all of these weighty posts, I encourage whatever readers I have to explore the additional materials. Some of them might make your brains hurt or itch or explode or collapse in on themselves. All of those are good! Do more of the things that make these things happen! There is great happiness available to those that feed their minds! Every year, just like you, I have a “birth day,” which is a misnomer as I am not born on that day every year, although I was once. When people ask me why I don’t like to acknowledge my birthday I tell them that time is a continuum. It breezes from one tiny fraction of a second to the next without counting where (when?) it has been or where (when?) it is going. There are no fractions of seconds, of course. We made seconds up and then when those were too large, we fractionated them into as many decimal bits as we needed. Every year, just like you, I have a “birth day,” a misnomer as I am not born on that day every year, although I was once. When people ask me why I don’t like to acknowledge my birthday I tell them that time is a continuum. It breezes from one tiny fraction of a second to the next without counting where (when?) it has been or where (when?) it is going. There are no fractions of seconds, of course. We made seconds up and when those were too large, we fractionated them into as many decimal bits as we needed. We made minutes up at some point, perhaps when hours seemed too long or work seemed too slow. We made hours up when the days passed like sap in the wintertime. Days, weeks, months and years were strongly suggested by planetary, lunar and solar phenomena. To our credit, we noticed these patterns and live our lives waiting for them to begin – or end – a hard day, a boring hour-long meeting, a cold winter, a hot-and-muggy summer, the wet season, the dry season, etc. For a nice review, have a look at this. Typically, though, we don’t think of times much shorter than 0.17 seconds. That is approximately the time it takes to count each of the six beats (or in poetry, “feet”) in “one-Mississippi,” etc. The “one” gets sort of two beats and the “Mississippi” goes in four. If we are keyed into a speed sport, we may split things down to the tenth of a second – I’m not sure I can do this, but I’m relatively certain that people who judge these kinds of events may have a refined sense of one-tenth of a second. Then it’s down to the hundredths of a second and, although all sorts of stopwatches and “photo finish” timers work in that realm, I can’t imagine that the human mind can honestly do much more than watch as the hundredths accumulate into tenths. To say that differently, but not necessarily more helpfully, there are about 2×10+43 of these Planck times in one second (simply the inverse of 5.39116×10−44 seconds), which is obviously a huge number (2 followed by 43 zeros). The links for Planck time and length will allow you to explore this matter more thoroughly, but both use the speed of light (c=3.00×108 m/s), the gravitational constant (G=6.674×10−11 N⋅m2/kg2) and Planck’s constant (actually, the reduced Planck’s constant, which divides Planck’s constant by 2π), which is 1.054571800(13)×10−34 J⋅s. All this to say something quite simple – Planck time (and length) is derived in a fairly straightforward way using some well-established physical constants, although with some very careful consideration by Dr. Planck. His considerations have held up well; Planck’s constant is part of any useful high school chemistry or physics curriculum. The real takeaway here is that time and action are inextricably linked. For a Planck time to elapse, a Planck length must be traversed by a photon in a vacuum. A photon must start somewhere and, on its way to somewhere else, it must etch a Planck length in space. This linkage is pretty neat, however resolutely transfixed and “motionless” the avid reader may be in their chair. How can I say that? Are we ever still? No. If the energy of an atom and the energy of a photon, moving at whatever speed after going through whatever medium, are compatible, the photon is absorbed by the atom with an electron quantum leaping proportionately. This process takes about 1 femtosecond or 1x10−15 seconds (or 0.000000000000001 seconds). There is some infinitesimal distance involved in these transitions, but the distances, if they are meaningful at all, are on the order of Planck lengths and do not add meaningfully to the time it takes a photon to be absorbed. After that absorption occurs, a new cascade of intra-atomic events occur, each with an associated time, each a tiny bit longer, slower, more human-paced, than the absorption event. I would enumerate them, but instead, I’ll just use a picture, a table and a video for your edification. Transition Time Scale Radiative Process? These represent the different modes of vibration along covalent bonds. In addition to this motion, there are the rotations of each atom at the ends of each bond – and these modes of rotation get complicated really quickly, with spin orientations and precessing (this is what a top does when it spins – the wobble is precession) around axes. It’s all really a maddening, continuous mechanism of complexity. Even if all these molecules inside us were cooled to absolute zero, the motion would continue, although slowed. And all of them are like tiny clocks running at tiny fractions of a second – at an astonishing rate of speed, at roughly 10,000,000,000,000 to 100,000,000,000,000 times per second. But I am writing about time, not intra-atomic events, and we could all easily be lost inside an atom for the rest of time if caution is abandoned. It is part of the definition of being a chemist – getting lost in the atoms (or at least the molecules). And with phosphorescence events taking a tenth of a second (1×10-1 seconds (or 0.1 s)), we’re at the interval for phosphorescence and can almost comprehend this. Human lives are measured in seconds as well. Nine months of gestation is 23,328,000 seconds (give or take); ask any mother and she will be able to vouch for the satisfaction and endlessness of each second. We go to first grade at 6 years or 189,216,000 seconds and graduate high school after 567,648,000 seconds. Lives get into a murky middle bit after this and people hit benchmarks at various times, but it all comes down to life expectancy in the end. The people in Monaco, one of the richest in the world, have an average life expectancy of 89.52 years, which is 2,823,102,720 seconds – almost 3 billion seconds, people, while the people of Chad, bordered by Nigeria, Niger, Libya, Sudan, the Central African Republic and Cameroon, have a life expectancy of 49.81 years – 1,570,808,160 seconds – very close to being half the average life expectancy of people in the Principality of Monaco, bordered on three sides by France and on the fourth by the Mediterranean, home of casinos, yachts and the Grand Prix. In the United States, average life expectancy is 79.68 years or 2,512,788,480 seconds, 311 million seconds less than the average citizen of Monaco; when stated that way, it seems like a huge difference, doesn’t it? But we’re not done measuring out human life. In the U.S., we count forward from 0 (zero) B.C. and are currently in the year 2016 as I write this. Two thousand and sixteen years is composed of 63,576,576,000 seconds, only about 22.5 Monaco lifespans ago, but 40.5 Chad lifetimes ago (sort of crazy when you consider it that way). But B.C. (or B.C.E., the term used by anthropologists and anyone studying world history instead of Western European and Middle Eastern history) is just a convenient temporal interrupt in a much longer series of events. Our species crept into the genome around 200,000 years ago – a time that dwarfs the 2,016 years B.C.E. by two orders of magnitude or roughly 100-fold (100 x). Two hundred thousand years is a whole bunch of seconds – 6,307,200,000,000 seconds, or six trillion three hundred seven billion, two hundred million seconds (the time seems more awesome when typed out as words). But we’re not done yet. Anthropologists have found lots of bones of our ancestors, our nearest relatives to the great apes appearing between 6 and 7 million years ago, 30 to 35-fold more time than for the slow evolution of Homo sapiens, or between 189.2 trillion and 220.8 trillion seconds ago (keep in mind that the 0.2 and 0.8 in those number represent 200 billion and 800 billion seconds). But let’s keep going. The Cretaceous–Tertiary (K–T) extinction occurred around 65 million years ago; current theories favor a huge meteor striking the earth in the northern Yucatan peninsula; 2,049,840,000,000,000 seconds ago (2 quadrillion seconds). But the earth is believed to have coalesced from hot gases and particles of stardust into something like its current orbit around the sun around 4.5 billion years ago; various models move the digit after the “5” around (is it 4.49 or 4.54? ), but there is general scientific consensus around the 4.5 billion figure. 4.5 billion years equals 141,912,000,000,000,000 seconds quadrillion seconds ago, and it was not a livable planet at the time. The universe, on the other hand, is yet another order of magnitude older. There are at least five models for its age, but the weighted mean of these models puts the age at 12.94 billion years, thus giving the earth about 8 billion years to coalesce into the nasty, raging bit of heat that cooled to what we know and love now. If you do the dimensional analysis here (as I have done so often above), you get a universe that has been in existence creating stars and galaxies and solar systems and planets and moons and asteroids – and that continues to do all of those activities VERY actively right up until today – you get a universe of 408,075,840,000,000,000 seconds (408.1 quadrillion seconds). The universe has been in existence, plus or minus 2.3 billion years or so (see the link above) for 162,399,598.4 average American lifespans (one hundred sixty-two million three hundred ninety-nine thousand five hundred ninety-eight point four lifetimes). While I have divided up time into fractions of seconds at one end of the scale (the Planck time) and quadrillions of seconds at the other end of time, time is not a series of discrete events; it is continuous and seamless. If one divides a Planck time by another Planck time, the fraction of a second gets shorter – it is about 1×10-89 seconds. One can keep doing this – infinite divisibility – and never reach the continuous nature of time; it will always result in smaller and smaller fractions of time with seamless continuity of the asymptote. This is heady stuff and nearly impossible to understand, except through metaphor and analogy, without the help of advanced mathematics and profound amounts of deep thought (I am a mere chemist and find that I am boggled by these concepts, but I will not deny their allure (p.s. a mere chemist is different from the mythological mer-chemist)). I will not get into how long this, our, universe is likely to exist. It is an imponderable but is being pondered. Let’s leave the future to those who speculate on those matters (cosmologists and physicists).To conclude, time is a dimension that is infinitely brief (or continuous) and infinitely long (or continuous). Dividing it into human events is convenient, but none of us should pretend that we understand it except by comparing it with events in our own lives. This is not always true; anthropologists, paleontologists, cosmologists, physicists, geologists live on a timeline that, by nature of their study, makes more sense to them and is relatively unlimited by average lifespans and birthdays. We should be humble when we consider the enormity of what has been observed and consider the enormity of what has been observed and consider carefully what is known while allowing that we are not done observing and trying to learn and probably will never finish unless we cease to exist altogether.